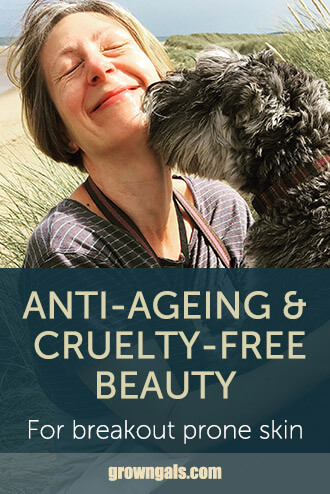 When I wrote a piece about cruelty free beauty and choosing products not tested on animals it supercharged my own search for the perfect anti-ageing routine. I think I’ve cracked it. It’s a balance of affordability, ease of use and results. I’m sharing what I’ve learned here without including links because I don’t really want to promote any particular brands – its just what works for me. The whole beauty thing pretty much passed me by – those are the pages I usually skip in magazines. Then in my late forties my jawline started sagging, my eyelids drooped and a bag settled permanently under each eye. Worse still, as menopause kicked in the pimples returned. For heaven’s sake! I’ve got combination skin which has always been prone to breakouts but these spots were under the skin and tough to shift. Vanity came calling. I tried plenty of anti-ageing tips including facial exercises to firm-up flesh and even a fresh urine rinse to exfoliate. The bad news is that my plump youthful complexion is gone forever. The good news is that I’ve discovered I can still improve my skin and slow down the ageing process. Body Shop’s Camomile gentle eye make-up remover easily gets rid of any mascara and lipstick. Cleanse with Paula’s Choice Resist Anti-ageing Foaming Cleanser for combination and oily skin. I used to use Liz Earle but its too heavy for me, if you like the idea of a skin cloth you can still use one with any cleanser. Alternate night A: smooth over face and neck with a few drops of The Ordinary’s Granactive Retinoid 5% in Squalane. This provides the anti-ageing benefits of pure Retinol but is less irritable. I started on the 2% formula but recently moved to the stronger version. When I started using it I my skin broke out big time but I read that this was normal and it soon calmed down. I don’t moisturise afterwards because the squalane leaves my oily skin silky and hydrated. Alternate night B: soak a cotton wool ball in The Ordinary’s Glycolic Acid 7% Toning Solution and smooth over face and neck. This is a leave-on exfoliant that removes dead skin cells. The acid toner is quite drying so I follow this with Paula’s Choice Clinical Ceramide-enriched Moisturiser which is a rich night cream with 0.1% retinol. Wash face in the shower with an everyday foaming cleanser such as Body Shop’s Seaweed Cleansing Gel. 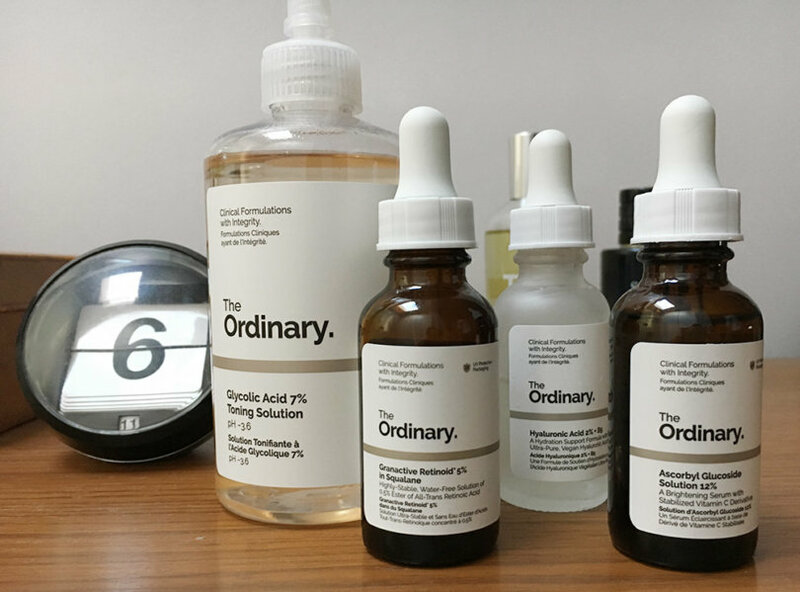 Apply a few drops of Hyaluronic Acid by The Ordinary to hydrate and plump the skin. Smooth over a few drops of Ascorbyl Glucoside Solution 12% by The Ordinary. This is a vitamin C solution that is an antioxidant to protect and brighten the skin. 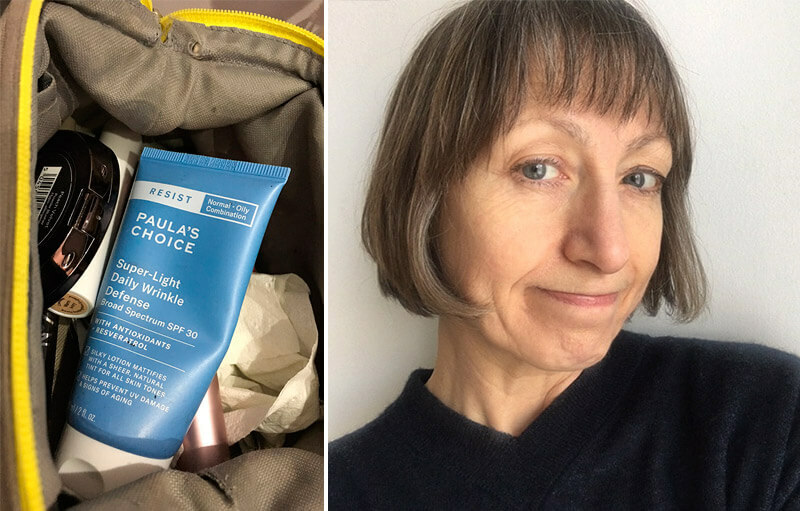 Winter/spring/autumn: Paula’s Choice Resist super-light moisturiser SPF 30. I read that the single most important anti-ageing action is to wear sun protection on the face every day, even in mid-winter. This is a lightly tinted moisturiser that smooths out skin tone just enough for someone like me who hates any kind of heavy make-up. Summer: Resist anti-aging Moisturiser SPF 50 again by Paula’s Choice. They call this a youth-extending daily hydration fluid for combination and oily skin and I love it. One tube lasted a whole summer and there’s still a bit left. It doesn’t contain any make-up tint but you’ll have a soft golden tan so it won’t matter. This routine helps to keep spots at bay and gradually removes the stubborn hard lumps under the surface. I also get milia which are hard little white balls of protein that sit under the skin. These too melt away or rise to the surface to be gently popped. I imagined as I got older my skin would naturally become dry and I could finally put spots behind me. No such luck. It’s quite simple, I suffered from hormonal acne right through my twenties after my periods started and it’s happen again now they’ve stopped. But this time round I’m managing it because I’ve learned how to fight it with products which are now significantly better. My advice is to get to know your own skin and experiment because what works for me almost certainly won’t work for you. I need light formulations and many products targeted at older skin are too rich and creamy for me. I discovered Paula’s Choice through their cruelty-free credentials and noticed they had anti-ageing products specifically designed for oily skin that’s prone to breakouts. That was my eureka moment. I was able to read up on a whole new list of active ingredients that could work for me: Retinol, AHA and BHAs, vitamin C. Then I discovered Deciem’s affordable versions of these same scientific formulas sold under The Ordinary brand. I use a mix of more expensive and cheaper products – but I regard them all as value for money because they work. I hope you’ll start your research with cruelty-free too. No animal should suffer in order for us to have better skin. Ethical brands also tend to use organic and vegan ingredients and leave out the nasties like parabens, sulphates, formaldehyde etc. And don’t forget the very best beauty tip of all: be happy. My name is Avril – midlife designer, writer, gardener, cook and bottle washer. I live and work in East London with my childhood sweetheart and our mini schnauzer Ricci. Copyright © 2016. Created by Broadbase. Powered by WordPress.